There's no place like Amelia Island. Make the most of your time here with these guides and make memories. Discover the charm of this vibrant seaside town, home to a 50-block National Historic District and an array of independent shops, restaurants, and watering holes. 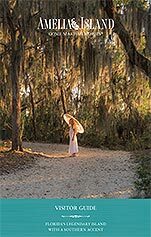 Set on the Atlantic Ocean, crowned by the maritime forest canopy, and home to some of Florida's most stunning parks, Amelia Island is a natural beauty. Amelia Island is alive with theater, music, art walks, concerts, and acclaimed festivals. Bring the whole family and discover a timeless, friendly place with experiences for all ages. Eat, drink, and savor more than 90 independent restaurants featuring fresh catches and more. The links of Amelia Island offer irresistible play for golfers of every skill level. Discover a haven for recharging your mind, body, and spirit. Come and enjoy the many events on Amelia Island.